The Cluster Munition Coalition (CMC) is a global civil society campaign working to eradicate cluster munitions, prevent further casualties and put an end to the suffering caused by these weapons. The coalition, active in around 100 countries around the world, works to change the policy and practice of governments and organizations, and to raise awareness of the problem amongst the public. The CMC works through its members to change government policy and practice on cluster munitions – especially through promoting universal adherence to and full compliance with the 2008 Convention on Cluster Munitions – as well as to raise public awareness of the problem and the ban treaty through civil society campaigns and the media. The CMC raises awareness and advocates at the national, regional and international levels. Through its global membership the CMC brings the reality of cluster-affected communities into the diplomatic arena. 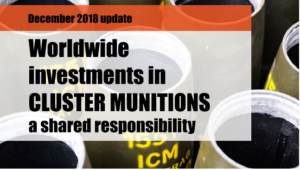 CMC campaigners around the world work in a spirit of cooperation with their governments and other partners to ensure countries join the Convention on Cluster Munitions and live up to the letter and spirit of the treaty. In 2011, the CMC merged with the International Campaign to Ban Landmines to become the ICBL-CMC – one organization with two separate campaigns on cluster munitions and on landmines.